Working closely with the Jewish Alliance President and its Board BTGA has developed a plan for the Jewish Community Center building in Providence that is intended to unite a building that attempts to contains all aspects of the Rhode Island Jewish Community. The existing building is a difficult and often brutal example of recent modern architecture. Our plan cuts new circulation paths through the building opening up views, from floor to floor and between programs, that have never existed before. 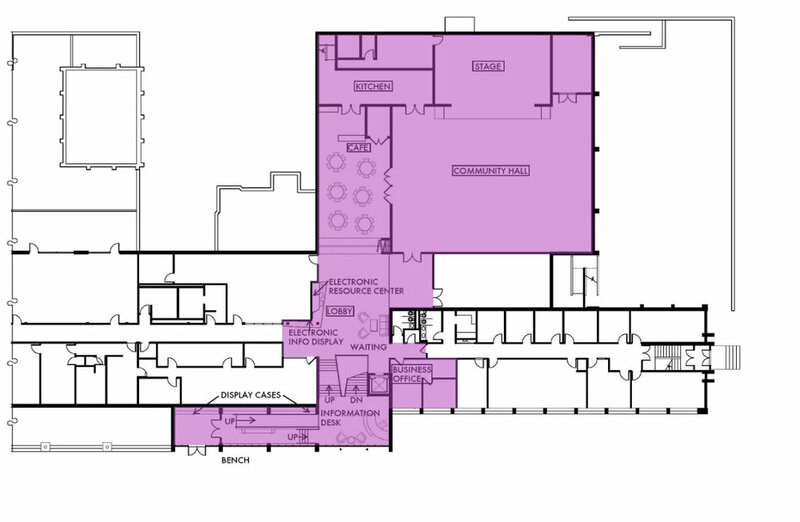 New spaces for interaction and niches for different groups are provided along circulation paths that are intended to lead to chance meetings and new connections. The main building reception is moved outside of the current building footprint in a glass addition to present a welcoming face and an organizing element within the building. From this entrance connections to all the buildings programs are to be visually evident. A renovated community room and a new café, as the most immediate program spaces, become prominent and easily accessed. This addition is to become the new face of the JCC and the community at large.